Huskies defenceman Tyler Borstmayer celebrates his first career CIS goal. The unsung heroes delivered when the University of Saskatchewan Huskies men’s hockey team needed them the most. All season, the Huskies prided themselves on the fact they had more depth and balance throughout their lineup than they did a season ago. That showed when the team topped the Canada West standings with a 22-6 mark. During the clutch moments, the rookie line of Levi Cable, Kohl Bauml and Andrew Johnson seemed to lift the Dogs to another level. Their ability as a unit to flat out create offence has been a game changer. In a long playoff run, teams can’t just rely on their top offensive line. The deeper you go in the post-season the harder it becomes to score. Others need to step up and deliver on the scoreboard. Others did just that on Saturday night at the ancient Rutherford Rink, as the Huskies posted a 5-3 victory over the U of Calgary Dinos to sweep a best-of-three Canada West semifinal series 2-0. U of S’s high scoring rookie line accounted for one goal, which Cable dumped into an empty net with 12 seconds to play to lock up the final outcome. With the Dinos doing their best to limit the Huskies top unit, U of S had to look towards other sources to score and pull out victory. Cameron Blair has three assists for the Huskies on Saturday. The challenge to have others score also got that much bigger, when the Dinos jumped out to a 2-0 just 5:44 into the contest on singles from Ryan Suchorab and Danny Gayle. The tallies silenced a packed Ruthy for a short time, and one had to wonder if a series deciding Game 3 was going to be needed on Sunday. Despite the Dinos fast start, the Huskies, who are rated third in the Canadian Interuniversity Sport top ten rankings, gained some traction when gritty rookie forward Jaimen Yakubowski, who had three points in 15 regular season games, tallied at the 11:50 mark of the opening frame. Yakubowski’s goal re-energized the packed and raucous crowd at the Rutherford Rink and was an early momentum changer. While the Huskies continued to mount pressure, Dinos netminder and former Saskatoon Blades star Steven Stanford was doing his best to keep the host side at bay. U of S broke through again on the scoreboard at the 13:49 mark of the second, when an on ice point shot from sophomore defenceman Tyler Borstmayer found its way to the back of the Dinos goal. Borstmayer’s first ever CIS goal pulled the Huskies even at 2-2. Parker Thomas played a strong energy game for the Huskies. With 3:43 to play in the second, Kendall McFaull, who is earning a reputation as the Huskies “Captain Clutch,” put home an accurate off-speed point drive to put the Dogs up 3-2. Early in the third, the Huskies lead expanded to 4-2, when Connor Cox, who is a former Saskatoon Blades blue-liner, laser beamed home another point shot through a screen. In the four-goal outburst, sophomore forward Cameron Blair quietly helped set up three tallies. He almost matched his regular season total of assist in one game. Blair played in all of the Huskies 28 regular season games collecting seven goals and four assists. The Dinos still didn’t go quietly. U of C star forward Elgin Pearce potted his sixth of the post-season with 1:17 to play in the third to cut the Huskies edge to 4-3. U of S clamped things down defensively from there, and Cable’s goal ensured a comeback was not to be. Stanford, who stopped 77 shots in a 4-3 double overtime loss to the Huskies in Game 1 on Friday, turned aside 38 of 42 shots to take the loss in goal for the Dinos in Game 2. Cooke made 21 stops to earn the win in goal for the Huskies, who took all six of their encounters with the Dinos this season. The crowd at the packed Rutherford Rink cheers a Huskies goal. Besides the offence, the Huskies also received strong contributions from players like energy forward Parker Thomas, who was key for the green and white on the forecheck. U of S advances to host the best-of-three Canada West championships series against their forever rivals - the U of Alberta Golden Bears. The Golden Bears, who have won the last two CIS titles, swept their semifinal series slipping past the Mount Royal University Cougars 4-3 in Edmonton on Saturday. Game 1 of the Canada West championship series will start this Friday at 7 p.m. at the Rutherford Rink. The Huskies also earned a berth to the eight-team CIS championship tournament, which runs March 17-20 in Halifax. That will mark their fourth appearance at nationals in the last five years. If the Huskies want their playoff success to continue, they need the X-factors to keep producing along with their top players. If that keeps happening, they might just win it all for the second time in team history. The Huskies celebrate Kendall McFaull's double overtime winner. Kendall McFaull’s most unlikely power-play goal might have been the biggest of his hockey career. With 3:33 remaining in a second overtime period, McFaull slipped home a bad angle shot to give his University of Saskatchewan Huskies men’s hockey team a 4-3 Canada West playoff victory over the U of Calgary Dinos on Friday night at the ancient Rutherford Rink. McFaull’s power-play marker came from an awkward angle from the left side of the Dinos goal and gives the Huskies 1-0 lead in a best-of-three Canada West semifinal series between the two clubs. The Huskies, who are rated third in the Canadian Interuniversity Sport top ten rankings, will try to lock up the series in Game 2 on Saturday at 7 p.m. at the Rutherford Rink. “It feels great,” said McFaull about his overtime winner. “It was definitely the biggest goal of my career. I thought we had tonnes of chances early to put it away, and we still couldn’t get it. McFaull’s winner spoiled a spectacular performance by Dinos goaltender Steven Stanford. The former star of the WHL’s Saskatoon Blades turned away an incredible 77 shots taking the loss in goal. Kendall McFaull was the Huskies' hero on Friday. The Huskies peppered Stanford with shots from all sorts of angle, but the Calgary product kept giving his side a chance to stay in the game. One of his best stops came in the first overtime session, when he turned away Huskies centre Logan McVeigh from close in with a kick stop. Jordon Cooke made 34 saves to pick up his first career Canadian Interuniversity Sport playoff win in goal for the Huskies. While he wasn’t as busy as Stanford, Cooke had to come up with a game-saving stop early in the second overtime, when he sprawled out to deny high-scoring Dinos forward Elgin Pearce on a breakaway. The two teams entered the third locked in a 2-2 tie. Just 70 seconds into the frame, Chris Collins netted his second goal of the post-season to put the Dinos up 3-2. The Huskies responded with a big push back and second-year forward Michael Sofillas potted the equalizer with 6:42 to play in the third. Josh Roach and Kohl Bauml each had the other singles for the Huskies. Dylan Walchuk and Kevin King picked up singles for the Dinos. Near the halfway point of the first overtime, fifth-year forward Max Ross thought he scored the winning goal for the Dinos and even celebrated, but the puck did not find its way to the back of the Huskies goal. On the overtime winner, McFaull had to dig the puck out from under McVeigh before scoring the winner. Steven Stanford made 77 stops in a brilliant effort for the Dinos. If Game 3 is needed to decide this series, it will be held on Sunday at 7 p.m. at the Rutherford Rink. Including play in the regular season, the Huskies have won all five of their encounters with the Dinos in the 2015-16 campaign. In the other Canada West men’s semifinal series, the U of Alberta Golden Bears took Game 1 of their best-of-three set with a 7-1 victory over the Mount Royal University Cougars in Edmonton on Friday. A Matthew Spafford goal will likely blow the roof off Rutherford Rink. The University of Saskatchewan Huskies men’s hockey team was expected to make some noise in 2015-16, but they blew past all expectations. In the Canada West Conference pre-season coaches’ poll, the Huskies were voted second behind the University of Alberta Golden Bears, who have won the last two Canadian Interuniversity Sport titles. Early season excitement for the Dogs had be to tempered by the fact they finished sixth in Canada West in 2014-15 with a 10-15-3 record and dropped a best-of-three first round playoff series to the Mount Royal University Cougars 2-1. The losing mark ended a run where the Huskies had recorded winning records for 18 seasons. That down year looks like just a weird blip on the radar screen now. The Huskies stormed through the 2015-16 regular season campaign matching their club record for wins finishing first overall in Canada West with a 22-6 record. U of S also won 22 games posting a 22-3-3 mark in 1999-2000 and a 22-5-1 record in 1987-88. Now they get to enjoy the spoils of fact all their opponents in the Canada West playoffs have to play under the rusty rafters of the ancient Rutherford Rink. After going out to support the U of Saskatchewan Huskies women’s during a bye week, the Huskies men’s team found out their opponent for a best-of-three Canada West semifinal series will be University of Calgary Dinos, who posted 12-12-4 record in the regular season. Huskies forward Levi Cable turns the corner on Dinos rearguard Dan Gibb. Game 1 is set for Friday at 7 p.m. at the Ruthy. Game 2 and Game 3, if necessary, follow on Saturday and Sunday respectively at the Rutherford Rink with a 7 p.m. puck drop set for both nights. The Huskies won all four of their regular season meetings with the Dinos. U of C advanced to play the Huskies after taking a best-of-three quarter-final series against the U of Manitoba Bisons 2-1 in Winnipeg. One of the big backbones to the U of S success has been the play of sophomore goaltender Jordon Cooke. Cooke set a new Huskies record for wins in a regular season at 19 posting a 19-5 record, a .921 save percentage, a 2.52 goals against average and two shutouts. The old record 18 regular season wins was shared between Jeff Calvert (1998-99) and Ryan Holfeld (2012-13). Cooke’s success has also been helped by the fact the Huskies have one of the best group of defencemen in the country. Their top six blue-liners in captain Kendall McFaull, Connor Cox, Jesse Forsberg, Jordan Fransoo, Zak Stebner and David Stumborg have been outstanding. The only worry comes on Stebner’s front, as the fifth-year veteran has been out with a knee injury since the Dogs dumped the University of British Columbia Thunderbirds 6-2 back on Jan. 23 in Vancouver. Chances are good Stebner will be a go, and the Huskies will gladly welcome back the five goals, 10 assists and plus-14 rating he put up in the plus-minus department in 22 games. Goalie Jordan Cooke has been huge for the Huskies all season. Fransoo topped all Huskies rearguards in offence putting up three goals and 16 assists in 26 games to go along with a plus-14 rating. The Huskies, who are rated third in the CIS top ten rankings, were able to take off this season due to huge impact of the rookie forward line of Kohl Bauml, Levi Cable and Andrew Johnson. Bauml and Cable were standouts in the WHL for the Everett Silvertips and Kootenay Ice respectively. Johnson came to the Huskies after a strong season in the junior A ranks with the West Kelowna Warriors after kicking around the WHL with the Moose Jaw Warriors, Seattle Thunderbirds and Swift Current Broncos over four-plus seasons. The trio appeared in all 28 of the Huskies regular season games. Bauml led the team in scoring with 12 goals and 21 assists, Cable was second with 16 goals and 12 assists, and Johnson was third with 13 goals and 13 assists. U of S also received solid offensive contributions from the rest of their forward group including Josh Roach, who had five goals and 13 assists in 25 games, Michael Sofillas, who picked up five goals and 10 assists in 24 appearances, Logan McVeigh, who netted seven goals and seven assists, and Jesse Ross, who had six goals and eight assists in 26 outings. The biggest cheers at Rutherford will likely be for fan and campus favourite Matthew Spafford, if he lights up the scoreboard. The fifth-year forward had two goals and an assist in 13 appearances. Rearguard Jordan Fransoo works the point for the Huskies. The Dinos won’t be pushovers, as their roster is filled with former WHL players who are used to navigating the ups and downs of a season in a highly competitive league. Forwards Elgin Pearce and Chris Collins both topped the Dinos in regular season scoring netting 27 points. Pearce had 11 goals and 16 assists, while Collins netted 10 goals and 17 assists. Max Ross led all Dinos rearguards in scoring with five goals and 13 assists. Dinos starting goaltender Steven Stanford didn’t have one of his best years between the pipes posting a 9-8-4 record, a .881 save percentage, a 3.18 goals against average and two shutouts. The former star of the WHL’s Saskatoon Blades returned to form in the Dinos first round series victory posting a 2-1 record, a .932 save percentage and a 1.69 goals against average. The last time the Huskies and Dinos met in the post-season came back in 2012, when the Huskies claimed the Canada West championships series with a 2-1 triple overtime victory in a series deciding Game 3 on a winner from Brett Ward. The winner of this year’s series will earn a berth to the CIS championship tournament, which runs March 17 to 20 in Halifax. The series victor will also face the winner of the other best-of-three Canada West semifinal series between the Golden Bears and Mount Royal University Cougars in a best-of-three Canada West championship series. Four good teams remain in the Canada West post-season hunt. If the Huskies have their way, they will add a few more magical moments at what should be a crazy atmosphere at a packed Rutherford Rink. Captain Danielle Nogier and the Stars open the post-season on Friday. The Saskatoon Stars begin their playoff journey hoping to earn another trip to the Esso Cup. The defending Saskatchewan Female Midget AAA Hockey League champs topped the regular season standings for a second straight year at 24-4, which was just shy of matching their 25-3 record in 2014-15. They open the post-season by taking on the Battlefords Sharks in a best-of-five quarter-final series. The Sharks finished last in the eight team league with a 3-23-2 record. It is beyond obvious to say the Stars will be heavy favourites to sweep this series. Game 1 is set for 7:15 p.m. Friday at the Agriplace Arena. Mackenna Parker, who is 15-years-old, finished second in the SFMAAAHL scoring race topping the Stars with 14 goals and 21 assists in 25 games played. Grace Shirley, who is 14-years-old, was second in Stars scoring with 18 goals and 14 assists. Offensive defender Willow Slobodzian led Saskatoon’s blue-liners in scoring with three goals and 12 assists. Standout 16-year-old netminder Emma Johnson is expected to carry the load for Saskatoon in goal. She posted a 13-4 record, a career best .942 save percentage, a 1,47 goals against average and three shutouts. Jordan Kulbida led the Sharks in scoring with five goals and seven assists. Chloe Marshall has been stellar in goal for the struggling Sharks posting a .906 save percentage. Her 2-12 record and 3.62 goals against average are a result from the high volume of shots she faced night in and night out. The 2016 post-season will mark the final times 17-year-olds Hollie Coumont, Rayah DeCorby, Danielle Girolami and captain Danielle Nogier will suit up for the Stars as they will all graduate from the midget ranks. Game 2 of the series is set for Sunday in Battleford, while Game 3 will be Wednesday at 7:15 p.m. at the Agriplace Arena. The Bisons and Huskies shake hands after their playoff series. Overtime in hockey is called sudden death for a reason, and the initial sting of losing hurts worse the longer it goes. On Sunday night, the ancient Rutherford Rink featured another classic game, but unfortunately for the host University of Saskatchewan Huskies women’s hockey team, they were able to come out on the winning side. At the 9:02 mark of a fifth overtime period, University of Manitoba Bisons standout forward Venla Hovi broke the hearts of the host Huskies and their supporters scoring the winning goal to deliver her side to a 2-1 victory in a match that finished at approximately 12:01 a.m. Monday. Hovi’s goal also ended the Huskies season as the Bisons took a best-of-three Canada West quarter-final playoff series between the two clubs 2-1. The Bisons advance on the Canadian Interuniversity Sport playoff trail to take on the University of Alberta Pandas in a best-of-three Canada West semifinal series. The Huskies were left to digest the end of their season, which was not an easy thing to do. They dropped what was the longest game ever in Canada West women’s hockey history spanning 139 minutes and two seconds. The Dogs were also involved in the match that formerly held the record, which was also another 2-1 setback at the Ruthy coming back on March 1, 2014 against the University of Regina Cougars in Game 2 of the Canada West championship series which lasted 122 minutes and 30 seconds. That loss drew that series even at 1-1. The Huskies had an opportunity to bounce back the next night, which they did defeating the Cougars 2-1 on a Kaitlin Willoughby double overtime winner to take the Canada West title. The Bisons celebrate Venla Hovi's winner in the fifth overtime period. In the loss to the Bisons, there is no chance to come back and play another game, because it was a series deciding Game 3. The effort the Huskies put up in defeat was valiant and heroic. They could have folded early on. Just 11 seconds into the contest, the Bisons went up 1-0 on a two-on-one break caused by a Huskies turnover. Hovi set up linemate Lauryn Keen, who put the Bisons up 1-0. The early U of M goal seemed to stun everyone in attendance. The Huskies push back was incredible. They peppered Bisons goaltender Amanda Schubert with shot after shot, while also playing some of their best hockey of the season. Their team game was solid, and they worked as a unit of five in all three zones. Finally at the 10:38 mark of the third period, centre Lauren Zary finally popped home the equalizer to knot the score up at 1-1. When the third period drew to a close, the two teams were going to overtime with the Huskies holding a 30-12 edge in the shots on goal department. In all reality, they deserved to have the edge on the scoreboard at that point. Off the two teams went into overtime. In extra time, the Huskies had to overcome some stormy seas. They killed off two Bisons power plays, where each came in the first and second overtime respectively. Marley Ervine played in her 155th straight game for the Huskies. In the third overtime, the Huskies had their chance with the man advantage, but they could not find the winner. They failed to score on five power-play opportunities on Sunday night and were scoreless on 13 total power plays in the post-season. Those misfires came back to ultimately haunt the Dogs. The contest had become a duel of goaltenders, with experienced fourth-year veteran Cassidy Hendricks turning away shot after shot for the Huskies and the heart on her sleeve Schubert holding her ground in the Bisons’ goal. Hendricks would make 40 stops in the contest, while Schubert turned away 66 shots. On the U of S side, everyone had top grade efforts. The future is bright with rookies like defender Leah Bohlken and energetic forwards Rachel Lundberg and Brooklyn Haubrich. In that trio, you can see part of the heart and soul of the team over the next four seasons. Veterans who were part of the Canada West winner in 2014 like Alyssa Dobler, Kira Bannatyne, Kori Herner, Kennedy Harris, Rachel Johnson, Hailey Tyndall and Willoughby emptied the tank. The now graduating fifth-years in Brooke Mutch, Hanna McGillivray, Julia Flinton, Paige Anakaer and Marley Ervine did everything they could to extend their careers. Ervine, the feisty forward who appeared in all 155 regular season and post season games in her five seasons with the team, was still firing lasers in what was the final overtime frame. Captain Paige Anakaer battles along the boards for the Huskies. Flinton’s end-to-end rushes as an offensive defender were as smooth as ever. Captain Anakaer battled with a heart that was unmatched and made her an inspiration to her teammates. Mutch and McGillivray were rocks as usual on the back end, and they created their own chances to net the winning goal. In the immediate aftermath of the marathon OT loss, the hurt is real and gut wrenching. When one sees the tears of the fifth year grads upon leaving the rink, even the hardest and most cynical of hearts had to melt. The Bisons celebrate a second period goal by Venla Hovi (#9). It is amazing in hockey how momentum can shift when a team that is down gets some traction. After posting a solid 3-0 win in Game 1 of their best-of-three Canada West quarter-final series on Friday night, the University of Saskatchewan Huskies women’s hockey team looked early like they would post a repeat performance in Game 2 Saturday night at the ancient Rutherford Rink. Instead, the visiting University of Manitoba Bisons turned the tide of the whole series with one play to skate away with a convincing 5-1 victory to even the series 1-1. The teams will play a series deciding Game 3 on Sunday at 7 p.m. at the Rutherford Rink. Huskies came out buzzing on Saturday night riding the wave they created from their Game 1 victory. They had golden chance early on to go ahead, when a point shot from fifth-year defender Hanna McGillivray rattled off the post. The hosts did draw first blood, when star offensive defender Julia Flinton popped home an off-speed point shot with 1:17 to play in the opening frame to give the Huskies what would be a short-lived 1-0 lead. With 13 seconds to play in the first, the series turned on a play that seemed to come out of the blue. The Bisons broke into the Huskies zone on a 2-1 and a set up pass from Alanna Sharman was deflected home in the air at about knee level by Venla Hovi, who is an import player from Finland. The Bisons bench came alive on the tally that tied things up at 1-1, and the visitors played like a different team than they had the whole series. Huskies goalie Cassidy Hendricks faced a lot of breakaways. Just before the 10-minute mark of the second period, the Bisons worked the puck around well down low causing the Huskies to lose focus on their positional play. Lauryn Keen slipped the puck over to Hovi, who was left open at the right side of the Huskies goal. She netted her second of the contest to put U of M ahead 2-1. At that point, the Huskies team play unraveled. Players would zip up ice individually with the puck hoping to make something happen instead of trying to create a play with their teammates. During other stretches, the Huskies would try to make a fancy pass in areas like the centre ice zone, when the more prudent decision would have been to get the puck deep in the offensive zone and charge in hard on the forecheck. The Bisons continued to play with sound structure, which helped create even more golden scoring chances. After a Huskies turnover, Keen, while being taken down, sent Sharman in on a breakaway, and she deked out Huskies netminder Cassidy Hendricks to make the score 3-1 for U of M. Hendricks had thwarted Sharman on an earlier breakaway when the contest was still tied. After drawing assists on the first three U of M goals, Keen scored at the 5:03 mark of the third on another breakaway to put the visitors up 4-1. Kayleigh Wiens rounded out the scoring for the Bisons with a third breakaway goal, which came unassisted after a U of S turnover. Alanna Sharman had a breakaway goal for the Bisons. Hendricks made 19 stops to take the loss in goal for the Huskies. Amanda Schubert, who was making her first start of the playoffs, stopped 22 shots to earn the win in goal for the Bisons. Heading into Game 3 on Sunday, the Huskies will be able to see on video everything they did wrong is easy to correct. Individually, the players have to keep their focus up. They also have to concentrate on playing as a group of five in all three zones. When the puck goes into the defensive zone, everyone has to dart back. When they bring the puck up ice through the centre ice zone, they have to attack that area with speed and together as a unit. In the offensive zone, they have to worry about making smart decisions, which means deciding at times to not thread a pass through three or four bodies, but get the puck down low and work a cycle. Those that don’t have the puck in the offensive zone need to move into an area to offer an outlet to support the puck carrier. The series is there for the taking. If the Huskies stay focused and play as a unit of five in all three zones, they will give themselves a chance to advance. They have done that in the past, and they have to remember they have the ability to do it again. Bailey Braden had a series winning goal for the Cougars. In Regina on Saturday night, the University of Regina Cougars swept away the University of Calgary Dinos in the other Canada West women’s hockey best-of-three quarter-final series. Bailey Braden scored on a first period power play and Toni Ross made 29 saves to power the Cougars to a 1-0 victory over the Dinos. Hayley Dowling stopped 27 shots to take the loss in the U of C net. The Cougars took the best-of-three series 2-0. In Game 1, they dumped the Dinos 4-1, while holding a 45-14 edge in the shots on goal department. The Dinos, who finished sixth in the Canada West standings, had stormed into the playoffs winning nine of their last 11 regular season games before bowing out. They will play in the Canadian Interuniversity Sport championship tournament as the host squad. The eight-team national championship event runs March 17-20 in Calgary. The Cougars, who were third in Canada West, advance to face the University of British Columbia Thunderbirds in a best-of-three Canada West semifinal series. The winner of Game 3 between the Huskies and Bisons on Sunday advances to face the first place University of Alberta Pandas in the other Canada West best-of-three semifinal series. Sunday’s Game 3 with the Bisons will mark the final time the Huskies play at home in the 2015-16 campaign. Kaitlin Willoughby (#17) celebrates her hat trick goal with her teammates. Kaitlin Willoughby called her shot and backed up her words. The standout left-winger for the University of Saskatchewan Huskies women’s hockey team told head coach Steve Kook she was going to get a hat trick in the club’s playoff opener in a text message chat. Willoughby did just that on Friday night at the ancient Rutherford Rink netting all three of her team’s goals in the Huskies 3-0 victory over the University of Manitoba Bisons. The win allowed the Huskies to take Game 1 of a best-of-three Canada West quarter-final playoff series, and they will look to close things out on Saturday night at 7 p.m. at the Rutherford Rink. The three-goal night was a first for the Prince Albert product during her three campaigns in the Canadian Interuniversity Sport ranks. Her offensive instincts put the Huskies up 1-0 at the 13:32 mark of the first period. With linemate Lauren Zary speeding down the left wing with the puck, Willoughby zipped up through centre to create a two-on-one rush. Zary fed Willoughby a perfect pass and the graduate of the Prince Albert A & W Bears midget AAA team broke towards the goal and put a backhander past Bisons netminder Rachel Dyck. Kaitlin Willoughby circles in the offensive zone with the puck. After a scoreless second, Willoughby netted her second marker seven minutes into the third tipping a home a point shot from star offensive-defender Julia Flinton and iced the game with an empty-net tally with 1:32 to play. “It was perfect timing,” said Kook about Willoughby’s three-goal night. “You need your best players to play good in big games like that. The Huskies got out to a bit of slow start on Friday due to having to kill a couple of early penalties. From that point, the hosts began to string a number of strong shifts together. Cassidy Hendricks made 21 saves to earn her first shutout victory of the overall 2015-16 campaign. She made at least four huge stops at critical times that could have allowed the Bisons to build some momentum. Dyck turned away 28 of 30 shot taking the loss in goal for the Bisons. Willoughby said her squad has to go into Saturday’s game with a clean slate and added there were a lot of positives to build off of from Friday night. “I am really happy with our team’s effort tonight,” said Willoughby. “I think there is a couple of things we just need to work on like just clean up our D-zone a bit. Captain Paige Anakaer returned from injury to the Huskies lineup. NOTES – Huskies captain Paige Anakaer played in her first game for the U of S after suffering a knee injury in a 2-1 home loss to the University of British Columbia Thunderbirds back on Jan. 22. She centred an energy/checking line containing rookie wingers Brooklyn Haubrich and Rachel Lundberg, who helped pin the Bisons for long stretches in their own zone. Fifth-year feisty forward Marley Ervine played in her club best 153rd consecutive game for the Huskies including action in the regular season, post-season and the CIS championship tournament. She had a helper and was a plus-two in the plus-minus department. Most if not all the members of the U of Saskatchewan Huskies men’s hockey team was at the Ruthy on Friday night and their cheering helped create an atmosphere that felt at times similar to that of the former home barn of the WHL’s Moose Jaw Warriors - the late Moose Jaw Civic Centre. The visiting Bisons appeared to be rattled at times due to the noise. Friday’s win was the first in the post-season for the Huskies since they downed the Wilfrid Laurier Golden Hawks 6-3 in the bronze medal game of the CIS championship tournament in Fredericton, New Brunswick, in March of 2014. Marley Ervine, right, celebrates a goal with a pair of teammates. The last time the University of Saskatchewan Huskies women’s hockey team hosted a post-season game at home they won the Canada West title in 2014. The way this season’s playoff picture has shaped up it wouldn’t be a surprise if the Huskies venture back to the conference final and land a spot in the Canadian Interuniversity Sport championship tournament, which runs March 17 to 20 in Calgary. With that said, no guarantees can be made in the Canada West women’s hockey ranks in 2015-16 judging by the regular season standings. The Huskies finished a solid in the eight-team circuit with a 14-9-5 record, and were six points shy of first place and nine points from missing the post-season all together. They locked up a playoff berth in their third last contest of the regular season. Any of the six teams that are alive in the post-season can envision themselves in post-season glory. The Huskies open a best-of-three Canada West quarter-final series on Friday against the University of Manitoba Bisons, who finished fifth in Canada West with a 13-13-2 mark, on Friday at 7 p.m. at the ancient Rutherford Rink. Game 2 follows on Saturday and Game 3, if necessary, will be Sunday at 7 p.m. at the Rutherford on both nights. The Bisons played the Huskies extremely tough in four head-to-head contests, where each side won twice. The fact that Huskies have home ice advantage will likely give them that extra kick to get out of the first round. Julia Flinton topped the Huskies in scoring. With a series victory, the Huskies would likely travel to Vancouver to face the second place University of British Columbia Thunderbirds (16-9-3) in the semifinal round. The fate of a possible series there likely revolves around the health of Thunderbirds veteran star goalie Danielle Dube, who was injured last Saturday in goal mouth collision in a 4-3 road loss in Winnipeg to the Bisons. Dube was carted off the ice, and if she is unable to play or is less than 100 per cent, the chances of beating the Thunderbirds in Vancouver get easier. If the Huskies get past that round with that scenario, they would actually end up hosting the Canada West final at home, because the conference’s other first and third place clubs would be taken down by a red hot U of Calgary Dinos team. The Dinos are assured of a spot at the eight-team CIS championship tournament due to the fact they host the event. They struggled during the first half of the campaign before closing the regular season winning nine of their last 11 games to qualify for the Canada West playoffs with a 12-12-4 record. Their Russian imports Iya Gavrilova and Sasha Vafina have played some of their best hockey finishing first and second respectively in conference scoring. Gavrilova had 20 goals and 23 assists, while Vafina had 14 goals and 21 assists. Third-year netminder Hayley Dowling has had a breakout campaign posting a 10-5-1 record, a 2.30 goals against average, a .915 save percentage and two shutouts. She started every contest in U of C’s season ending hot stretch. The Dinos have the game breakers offensively and are solid in goal. As a sixth seed, they have a good chance of running the table on the road and have to be looked at as the favourites to win the Canada West title. Marley Ervine has played 152 straight games for the Huskies. U of C heads to Regina this weekend to face the University of Regina Cougars in a best-of-three quarter-final series. The Cougars led the conference in wins at 17 posting a 17-10-1 record, but fell to third place due to the fact five of their victories came in overtime. In Canada West women’s hockey, three points are awarded in the standings for regulation wins and two points are given for extra time victories, and the Cougars lost a chance to finish first due to that statistical factor. The Cougars have won seven of their last 10, so the series with U of C will be a battle, but the Dinos might be too hot to stop at this point. If the Dinos win their quarter-final series, they would advance to play the first place University of Alberta Pandas (16-9-3) in the semifinal round. The Pandas won both meetings between these two clubs in Edmonton, but the Dinos have looked more like a first place team down the stretch. The Dinos will have a strong shot to knock off their provincial rivals. In the crazy Canada West season, it is realistic to see the Huskies host the Dinos in a best-of-three conference final, which would ensure the Huskies a berth at nationals. With that said, both the Huskies and Dinos could as easily be done in round one. An intangible that might help the Huskies is the fact they still have 12 holdovers from their Canada West winning championship squad in 2014. Out of those dozen holdovers, five are set to exhaust their fifth and final years of eligibility in Brooke Mutch, Hanna McGillivray, Marley Ervine, captain Paige Anakaer and star offensive defender Julia Flinton. Captain Paige Anakaer might return from a knee injury. Anakaer has been out with a knee injury suffered in a 2-1 home loss on Jan. 22 to the Thunderbirds, but the Moose Jaw product has been skating. All five have been heart-and-soul members of the team, and you can likely expect one last flash from this group. Flinton had her best season leading the Huskies in scoring with a career best 26 points coming on four goals and career high 22 assists. She was also a career-best plus-15 in the plus-minus department. Ervine, the feisty forward from Kindersley, had career bests in goals (nine), assists (15), points (24) and plus-minus (plus-8). Besides holding the Canada West record for career regular season games at 136, Ervine has never missed a game in her five seasons with the Huskies appearing in 152 straight contests including action in the regular season, post-season and CIS championship tournament. She would love to continue to grow that mark. The post-season is stage ready. The Huskies have great chance to step up into a leading role. The Blades celebrate a victory over the Broncos on Wednesday. The Saskatoon Blades finally found that little extra push to get back in the win column. On Wednesday, the Blades downed the visiting Swift Current Broncos 4-3 before 3,768 spectators at the Sasktel Centre thanks to doing a lot of little things right. The hosts blocked numerous shots, won a number of key puck battles, went 2-for-6 on the power play and killed off the five power-play opportunities the Broncos had. Starting goaltender Brock Hamm, who has been plagued by inconsistency, made 39 saves to earn the win in goal, which included a number of game-saving stops. Saskatoon also received goals from four different sources as Dustin Perillat, Josh Paterson, Cameron Hebig and Braylon Shmyr all potted singles. Saskatoon also overcame some rough spots. The Broncos scored in the closing seconds of the second period to cut a two-goal Blades lead to 2-1. With the Blades holding a 4-2 edge, the Broncos scored with 1:58 to play in the third to create a frantic finish, but the hosts successfully closed out the game. The Blades improved to 20-33-4 and sit 11 points behind the final playoff berth in the WHL’s Eastern Conference held by the Edmonton Oil Kings (24-26-6-1). Saskatoon only has 15 games remaining in its regular season schedule and would need to post a huge winning streak to have a chance of earning a post-season berth for the first time since 2013. A more realistic expectation for the Blades might be to focus on repeating their effort from Wednesday night each time they hit the ice through to their last 15 contests. With 20 wins and 44 points, the Blades have bested those totals from a season ago. They are still taking little steps forward, even if the big post-season step likely doesn’t come just yet. Grace Shirley swoops into the offensive zone for the Stars. The Saskatoon Stars will finish their Saskatchewan Female Midget AAA Hockey League regular season looking to tune up for the post-season. The defending SFMAAAHL champions last hit the ice on Jan. 31, when they thumped the Melville Prairie Fire 8-0 at the Agriplace Arena. They proceeded to play the waiting game to see if they would need to win one of their final two regular season outings to lock up first place in the eight-team league for a second straight year. The Swift Current Diamond Energy Wildcats were the only club that could catch the Stars in the standings, if they won their final six regular season games in regulation. When the Wildcats fell 5-4 after a tiebreaking shootout to the Notre Dame Hounds in Wilcox on Feb. 3, the Stars (22-4) captured first overall. Saskatoon heads to Battleford for clashes with the last place Sharks (3-21-2) on Saturday and Sunday. Stars forwards Mackenna Parker and Grace Shirley are likely long shots at this point to win the league’s scoring title. Both trail Regina Rebels forward Kennedy Bobyck who tops all scorers with 16 goals and 22 assists for 38 points. Bobyck recently turned 15 years of age. Parker is second in the league scoring race with 32 points coming on 14 goals and 18 assists. Shirley is third in SFMAAAHL scoring with 30 points coming on 18 goals and 12 assists. All eight clubs in the SFMAAAHL advance to the post-season. It has been almost two years since Crystal (Heisler) McGregor passed away of cancer, but she is still a key figure in the sports scene in Regina. In the late 1990s and early 2000s, McGregor was the point guard on the University of Regina Cougars women’s basketball team, when the Cougars were the most exciting women’s hoops squad in Canadian Interuniversity Sport. They ran teams out of the gym with their high tempo transition attack and never seemed to fatigue in the process. 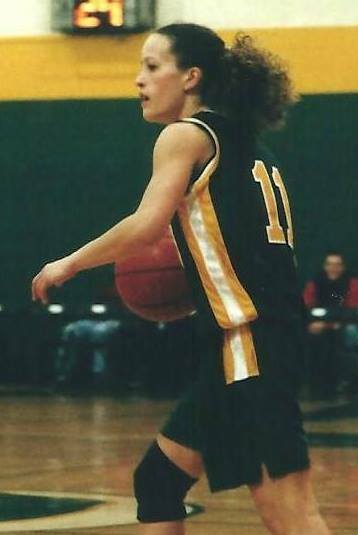 McGregor was the quarterback at the point guard position who dished off assists at will and had deadly accuracy from three-point range sporting her trademark #11 jersey. She was a key member of the Cougars CIS championship team in 2001. The graduate of Regina's Sheldon-Williams Collegiate is more remembered for her always upbeat personality away from the court and infectious smile. She was very caring and had a natural ability to make everyone around her feel comfortable and welcome. During McGregor’s years with the Cougars, little girls around the Queen City grew up with dreams of playing for the Cougars women’s hoops team. McGregor attained legendary status in the Regina sporting scene, as she moved on to coach basketball at the school and club levels following her playing days. On May 15, 2014, she passed away at age 35 after a battle with cancer that lasted over two years. Her motto during that battle was to “Dance In the Rain.” Her husband, Paul, became a single father with two young children in daughter, Aija, and son, Zayden. Aija was only eight-years-old at the time of Crystal’s death, and Zayden was age two. On Friday night, the Cougars basketball teams are inviting back all their alumnae and alumni and their families for their games that night with the U of Saskatchewan Huskies at the Centre for Kinesiology, Health and Sport on the U of R campus. Free tickets will be distributed to the alumnae and alumni and their families. The women’s game is set for 6 p.m. and the men’s game is slated for 8 p.m. Aija’s club team also plays a mini game during halftime of the Cougars women’s contest. Special tributes will be held for Crystal McGregor and funds will be raised for the Shine On Foundation, which helps give financial support to moms who are fighting an advanced cancer diagnosis and help them and their families create lifelong positive memories. You can bet there will be a special vibe in the Cougars home gym on Friday night. It will be another example of how McGregor’s memory continues to inspire and bring people together. The Huskies celebrate their 6-2 victory over the Cougars on Saturday night. The goal gusher finally came for the University of Saskatchewan Huskies women’s hockey team, and they will host a home playoff series because of it. On Saturday night at the ancient Rutherford Rink, the Huskies used a four-goal third period surge to dump their provincial rivals the University of Regina Cougars 6-2 to close their Canadian Interuniversity Sport regular season schedule. The six-goal outburst was the highest for the Huskies in any game this season. In their previous nine contests, the Huskies netted just 12 goals, which included falling 2-1 to the Cougars in double overtime on Friday in Regina. Saturday’s victory allowed the Huskies to improve to 14-9-5 to finish fourth in the Canada West conference. They will host the fifth place University of Manitoba Bisons (13-13-0-2) in a best-of-three first round series that is expected to start this coming Friday at the Rutherford Rink. Kaitlin Willoughby scored twice for the Huskies on Saturday. The Huskies drew first blood in Saturday’s contest scoring on the power play, when feisty forward Marley Ervine tipped home a point shot from star defender Julia Flinton. The hosts proceeded to go up 2-0 before the first period ended, when Kaitlin Willoughby deflected home a shot from linemate Lauren Zary. U of R responded with a huge push back in the second period as standout sniper Kylie Gavelin netted her 11th of the season, while Bailey Braden potted the equalizer at the 9:27 mark to tie things up at 2-2. The Huskies countered the Cougars surge with their big third period outburst. The surge began at the 2:36 mark when Willoughby scored her second of the contest on a brilliant individual rush down the right wing where she roofed a backhander top shelf. Just 52 seconds after that tally, Johnson scored the first of her two goals on the night. The Edmonton product picked up her second marker just past the midway point of the frame popping home a shot while falling to the ice. Checking forward Kennedy Harris rounded out the scoring flipping home a long distance empty-net goal with the Cougars working a power play. Cassidy Hendricks made 29 stops to earn the win in goal for the Huskies. Toni Ross, who set a Cougars record for wins in a season at 17, turned away 15 of 20 shots taking the loss in goal for the U of R.
Rachel Johnson, centre, celebrates her second of two goals for the Huskies. The Prince Albert product was pleased to net her first multi-goal game of the season. “It was really nice actually,” said Willoughby. “The one goal I honestly had to do nothing. Zary made an amazing play. The Cougars, who were rated 10th in the CIS top ten rankings, entered Saturday’s game needing a regulation win to potentially finish first in Canada West and earn a bye into the semifinal round of the post-season. They dropped to 17-10-1 to finish third, which means they have to face the red hot University of Calgary Dinos in a first round best-of-three series. The Dinos finished with a 12-12-4 record after winning nine of their past 11 games. Goalie Cassidy Hendricks makes a kick save for the Huskies. In a weird twist, the Cougars actually recorded the most wins in the conference. In Canada West women’s play, three points are awarded in the standings for regulation wins and two points are given for extra time victories, and the Cougars finished behind both the University of Alberta Pandas (16-9-3) and the University of British Columbia Thunderbirds (16-9-3) due to claiming victory 12 times in regulation. The Pandas had 15 regulation wins and the Thunderbirds had 13 regulation victories. The Huskies head into the post season having split their four encounters with the Bisons. Johnson is hoping her squad can find some magic to help capture a second conference title in three seasons. The Huskies won their first Canada West crown two years ago. Kohl Bauml scored for the Huskies on Saturday night. The U of Saskatchewan Huskies men’s hockey team finished their regular season with a comeback attempt that came up just short in Regina on Saturday night. The host U of Regina Cougars jump out to a 3-0 lead at the 5:54 mark of the first period before the offence got going for the visitors. The Huskies rallied back to force a 3-3 tie heading into the second intermission, but fifth-year U of R forward Brock Appleyard netted the only goal in the third and his second tally of the night to give the Cougars a 4-3 victory. Stephen Langford and Sanfred King each had singles for the Cougars, while Mitch Kilgore turned away 27 shots to earn the win in goal. The Cougars finished last in Canada West with a 7-21 mark. Sean Aschim, Levi Cable and Kohl Bauml replied with singles for the Huskies. Blake Voth, who was making his fourth start of the campaign, turned away 27 shots taking the loss in goal for U of S.
The Huskies, who were rated third in the CIS top ten rankings, had first place in Canada West locked up going into their last four games and finished with a 22-6 record. Their 22 victories equals a club record for wins in a regular season. The Huskies men’s team earned 22 wins in 1999-2000 finishing 22-3-3 and in 1987-88 recording a 22-5-1 mark. On Friday, the Huskies downed the Cougars 5-3 at the Rutherford Rink to allow Jordon Cooke to set a new school record for individual goaltending wins in a season at 19. During the regular season, Cooke posted a 19-5 record, a 2.52 goals against average, a .921 save percentage and two shutouts. The old record of 18 wins in a regular season was shared by Jeff Calvert (1998-99) and Ryan Holfeld (2012-13). The Huskies have a bye into the semifinal round of the playoffs and will be off next weekend waiting to see who they will play in a best-of-three series. Brendan Guhle, right, gives his No. 4 jersey to Dave Manson, left. Dave Manson stands as the symbol of everything that is good about Prince Albert’s WHL hockey team. He is to the Raiders what Roger Aldag is to the CFL’s Saskatchewan Roughriders. On Friday night before a standing room crowd of 2,852 spectators at the Art Hauser Centre, the Raiders retired Manson’s No. 4 jersey in a pre-game ceremony before they faced and beat the Regina Pats 3-2. It was a long overdue honour for the local product, but the wait might have made the emotion of the night that much more special. Growing up in the small Saskatchewan Centre that is called the “Gateway to the North,” Manson endeared himself to the citizens there because he is genuine and has always been a first class person. He also excelled in many sports growing up, and if you look up the back issues of the local Prince Albert Daily Herald at the local library, you can uncover stories of Manson ripping up the local minor football league that existed in his youth or setting records that would stand for over 25 years at high school track and field meets. Of course, his story settled around the fact he focused on hockey. He came to the Raiders on a six-game call up during their first season in the WHL in 1982-83, but he wasn’t the best player on the ice. Manson worked hard and improved with great grit and determination. The citizens of Prince Albert have always loved their lunch pail characters who brought it every day, and in the following three seasons after the 1982-83 campaign, they developed great pride in watching one of their own reach star status with the Raiders patrolling the blue-line. Dave Manson shouts out orders from the Raiders' bench. In total, Manson played 218 regular season games for the Raiders between 1982 and 1986, recording 24 goals, 72 assists and 666 penalty minutes. After the franchise’s third season in the major junior ranks, Manson helped the Raiders win junior hockey’s ultimate prize in the Memorial Cup in 1985. Also that year, he was selected in the first round and 11th overall by the Chicago Blackhawks in the NHL Entry Draft. Standing 6-foot-2 and weighing 202 pounds, Manson played with great heart and passion, which can still be easily seen when he stands behind the team’s bench these days as an associate coach. The Raiders are a team that is viewed as having a hard working image with a rough and tumble physical edge, and Manson was the living example of that. He was also the man who stepped up and took care of business when something underhanded went down on the ice, and those moments really brought the Prince Albert faithful out of their seats. Around hockey, the Raiders are viewed as a franchise where honour still matters and it is likely no one has more honour than Manson. If Manson’s story with the Raiders had ended there, he was assured of legendary status in Prince Albert. After his playing days with the Raiders, Manson went on to play in 1,103 career regular season games in the NHL from 1986 to 2002 collecting 102 goals, 288 assists and 2,792 penalty minutes with the Blackhawks, Edmonton Oilers, Winnipeg Jets, Phoenix Coyotes, Montreal Canadiens, Dallas Stars and Toronto Maple Leafs. Dave Manson's No. 4 in the Art Hauser Centre rafters. Having always been a strong family man, Manson returned to the Prince Albert area to settle down after his playing days were finished due to the fact he has numerous family members there. Part way through the 2002-03 campaign, he became an assistant coach with the Raiders, and he has remained a key part of that team since that time. From that moment, his status elevated from legendary to iconic in Prince Albert. When he takes up position behind the Raiders bench, he can look into the stands and he seemingly knows all the faces that are in the crowd. It is a regular occurrence for him to walk the halls of the Art Hauser Centre, approach someone who you would think would be a stranger, address them by their first name and have some good-natured conversation with that person. Manson has also been a big influence in helping the Raiders players on the ice with their games, and their personal lives. Those that have played under Manson are pretty unanimous in agreeing he was one of their favourite coaches. The hometown boy had helped the Raiders win a national title as a player, went on to a great career in the NHL and returned home to be an integral part of the community. On Friday night, old friends from both his long ties with the Raiders and his NHL days like good buddy Kelly Buchberger arrived in Prince Albert for his jersey retirement ceremony. If Manson’s family and friends couldn’t be there, like his 24-year-old son Josh who was playing that night with the NHL’s Anaheim Ducks, they sent in moving video tributes. Defenceman Brendan Guhle, who will go down as the last Raider to wear No. 4, gave his jersey to Manson and donned a new No. 7 uniform. WHL commissioner Ron Robison presented Manson with the league’s Alumni Achievement Award and the Raiders brass presented him with a silver stick engraved with the names of all the teams he has played on during the festivities. When game time rolled around, the Raiders actually had a bit of a slow start, but hit stride when Yorkton midget AAA call up Carson Miller, who just turned 16, scored to give the hosts a 1-0 lead at the 10:28 mark of the first period. The Raiders lunch bucket work ethic got going as standout right-winger Reid Gardiner scored on the power play and rearguard Dalton Yorke potted what would be the game winner. Brendan Guhle drives a shot on goal wearing his new No. 7 jersey. Pats starting netminder Jordan Hollett was chased at the 5:37 mark of the second period turning away nine of 12 shots fired his way. Tyler Brown stopped all 13 shots he faced in relief. Austin Wagner and Connor Hobbs replied with singles for the Pats (23-23-3-4) in what was an outstanding hockey game. Playing with great structure and powered by Rylan Parenteau’s 24 saves in goal, the Raiders were able to clamp things down defensively and close out the victory. It was an effort that was a fitting tribute to Manson. The Raiders also improved to 31-18-5-1. Many in junior hockey circles look at the Raiders record this season and say they are overachieving. On the other side of that observation, the Raiders are showing what can be achieved when you play with good focus, hard work and passion, which are the traits Manson brought to his game every day. After the contest during a media scrum, Guhle reflected on handing his No. 4 jersey to Manson. The Raiders celebrate their 3-2 win over the Pats. “It was actually really special,” said Guhle. “We actually looked at each other in the eyes, and he actually had little tears in his eyes. Don’t tell him I said that. For Manson, he has enjoyed watching the players he has coached grow and mature, and he thought it was cool to receive Guhle’s No. 4 jersey. “It is very nice,” said Manson. “It is something for sure I know I will remember. Now Manson’s No. 4 hangs in the Art Hauser Centre rafters along with Mike Modano’s No. 9. However when one thinks of the Prince Albert Raiders, Manson is always the first player that comes to mind. If you any comments you would like to pass along about this blog post, feel free to email them to stankssports@gmail.com. The Pandas celebrate Natasha Steblin's OT winner. The University of Alberta Pandas women’s hockey team proved they win the ugly one. Had the host University of Saskatchewan Huskies claimed victory, they would have held that same distinction. On Saturday night at the ancient Rutherford Rink, the Pandas slipped past the Huskies 2-1 in double overtime in a match that resembled what a New Jersey Devils game looked like back in their Stanley Cup winning years. From the second period onwards, the contest was defined by a whole tonne of clutching and grabbing, and the officials could have called more penalties than 13 total infractions that were issued out. Actually, the officials seemed to be trapped in not knowing what calls they should let go and what infractions they should call, which helped to further drag the flow of play down. When the dust settled in the Canadian Interuniversity Sport regular season clash, one of the biggest differences that created the final outcome was the fact the Pandas went 2-for-6 on the power play, while the Huskies went 0-for-7 with the one-player advantage. The Pandas struck first in Saturday’s clash with 2:03 to play in the opening frame. While working the power play, fifth-year forward Lindsey Cunningham collected the rebound from a Natasha Steblin shot at the side of the U of S goal and potted her third of the season to put U of A up 1-0. As the contest progressed, it appeared Cunningham’s tally would hold up to give the Pandas victory. Both teams had trouble working their way up and down the ice, which helped cut down on the scoring opportunities for both sides. Julia Flinton had a huge goal for the Huskies. When scoring chances did come, Lindsey Post stood tall in the Pandas net, while Cassidy Hendricks ensured the Huskies remained within a goal. Just when the contest appeared to be stuck in a quagmire, Huskies offensive defender Julia Flinton netted the equalizer with four seconds to play in the third period on a beautiful solo rush. The Williams Lake, B.C., product picked up speed in the centre ice zone, blew by the Pandas defenders and slipped home a backhand shot past Post to even the score at 1-1. Near the end of the first four-on-four overtime period, the Huskies had huge chance to pull out the win, when they went on the power play after Pandas forward Deanna Morin was given a minor for checking to the head. The Huskies had three solid chance to win the game on that power-play chance including a point shot that deflected high into the air and almost lobbed into the U of A net. The puck ended up just settling on top of the goal. During a second overtime period played under a three-on-three format, the Pandas went to the power play after Huskies centre Lauren Zary was given a slashing minor. The visitors capitalized on that chance, when Steblin fired home the winner from the slot passed a screened Hendricks to give the Pandas a 2-1 victory. Hendricks made 18 stops taking the overtime setback in goal for the Huskies. Post made 24 saves to earn the win in goal for the Pandas. The Huskies record moved to 13-9-4, and they were able to clinch a berth in the Canada West playoffs with the point they earned from the overtime setback. With two regular season games to play, the Huskies sit fourth overall in Canada West two points up on the University of Manitoba Bisons. The Pandas improve to 14-9-3 to sit third in Canada West with a four-point cushion on the Huskies thanks mainly to having 13-10 advantage in regulations wins. The Huskies close the regular season with a home-and-home series with the U of Regina Cougars (16-9-1). The two teams play this coming Friday in Regina at the Co-operators Centre and this coming Saturday at 7 p.m. at the Rutherford Rink. Sean Aschim had a goal for the Huskies in Edmonton on Saturday. The University of Alberta Golden Bears served notice that they are still a force to be reckoned with in Canada West men’s hockey. On Saturday in Edmonton, the Golden Bears completed a two-game series sweep of the Canada West leading U of Saskatchewan Huskies posting a 5-2 victory before 1,653 spectators at the Clare Drake Arena. The sweep at the hands of U of A marks the first time the Huskies have dropped two straight game all season. The Golden Bears took Friday’s clash in Edmonton between the two club’s 3-0. In Saturday’s encounter, Levko Koper, Jordan Rowley and Thomas Carr netted singles to stake the hosts out to a 3-0 lead. Jesse Ross and Sean Aschim responded with singles for the Huskies to cut the Golden Bear’s lead to 3-2 heading into the second intermission. In the third period, Stephane Legault and Jamie Crooks potted singles to seal victory for the Golden Bears. Jordon Cooke made 32 saves to take the loss in goal for the Huskies. Luke Siemens turned away 17 shots to pick up the win in the Golden Bears net. The Huskies, who are rated first in the CIS top ten rankings, fell to 21-5, but they have already locked up first overall in Canada West. The Golden Bears, who are rated seventh in the CIS top ten rankings, improve to 17-7-2 to sit third in Canada West just one point behind the Mount Royal University Cougars (17-6-3). U of S closes its regular season with a home-and-home series against the University of Regina Cougars (6-20). The two clubs play this coming Friday at 7 p.m. at the Rutherford Rink and on Saturday in Regina at the Co-operators Centre.